With the first week of 2014 having already flown past in a blur, I'm sure I'm not the only one wondering how I'm going to stick to those New Year's resolutions of leading a healthier lifestyle. However, let's not be totally demoralised just yet! When doing some work on our upcoming Low Fat and Healthy Eating cookbook I came across tonnes of great simple recipes which are not only full of healthy credentials but, most importantly, look delicious. This in mind, I decided to try out some of the recipes to check that the dishes taste as good as they look! With the weather still being decidedly miserable, the first one pick was a hearty looking Italian Bean Soup. Now, I'll be honest, I'm not usually the kind of person who thinks soup constitutes an actual meal – I mean a starter maybe, but who is really full after a bowl of soup? But then I tried this recipe...the pasta and chunky beans mean that it is just filling enough to satisfy, without leaving you feeling that you've over-eaten. What's more, it's packed full of vegetables and protein-rich beans, making it a perfect candidate for a healthier lifestyle. Why not give this quick and easy recipe a try and see if you agree? 1. Heat the oil in a large saucepan. Add the leek, garlic and oregano and cook gently for 5 minutes, stirring occasionally. 2. Stir in the green beans and the cannellini beans. Sprinkle in the pasta and pour in the stock. 3. Bring the stock mixture to the boil, then reduce the heat to a simmer. 4. 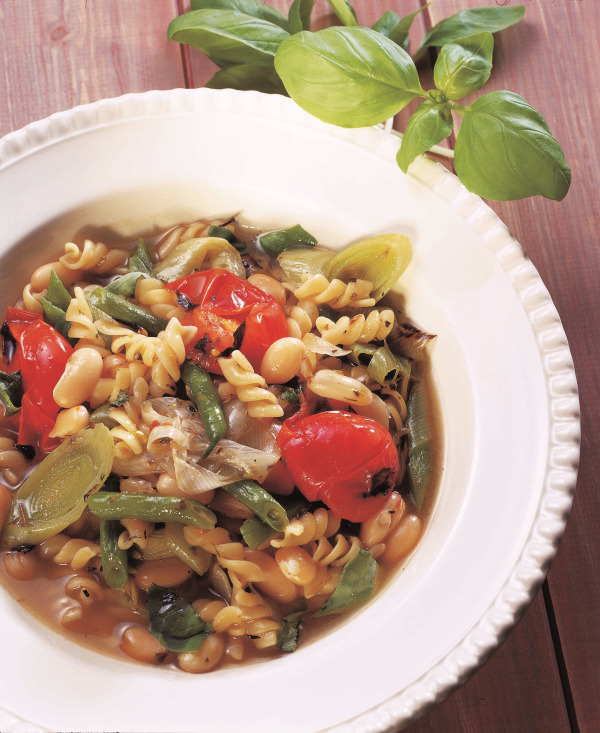 Cook for 12–15 minutes or until the vegetables are tender and the pasta is cooked to al dente. Stir occasionally. 5. In a heavy-based frying pan, dry-fry the tomatoes over a high heat until they soften and the skins begin to blacken. 6. Gently crush the tomatoes in the pan with the back of a spoon and add to the soup. 7. Season to taste with salt and pepper. Stir in the shredded basil and serve immediately. If you enjoyed this recipe and are looking for more ideas for how to eat healthily this year, check back next week for the second recipe instalment in my series of Top 5 Simple Recipes for Healthy Eating. If you'd like a break from all the January dieting, here's a great download!